Stated simply, customer engagement is the depth of the relationship a customer has with a brand. It’s a fair question that’s being asked with more frequency, as businesses are realizing that customer loyalty is largely a result of frequent positive engagement. As the typical consumer wields power with more information and choices, engagement has become the primary channel to ensure that a brand is “top of mind” when a purchase needs to occur. Each of those interactions hopefully connects the brand with the customer’s needs and preferences. Create those relevant messages with frequency, and that’s how customer engagement is built. 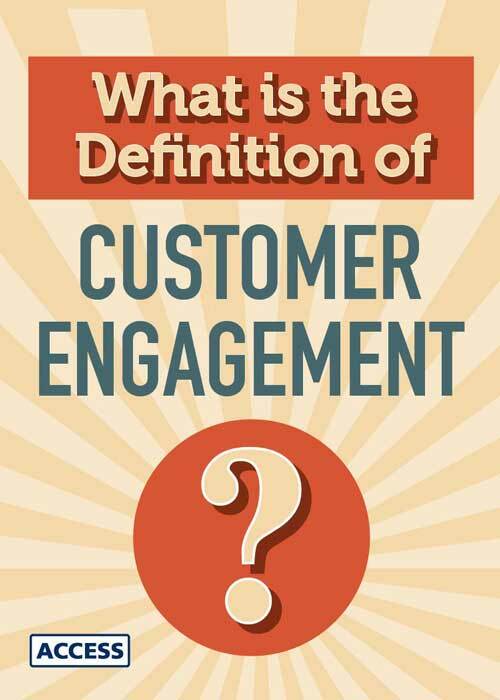 So what does an engaged customer look like? The reality is engagement takes a few different forms. Each of these traits represents a behavior of highly engaged customers. They’re Purchasers – The most obvious characteristic – they’re customers who pay, and continue to pay for a brand’s services or products. They’re Evangelists – They refer family and friends to the brand, whether they’re a purchaser or not. They also consume and re-broadcast brand content to their social networks. They’re Responders – They engage in dialog with a brand, providing constant feedback. Don’t discount their value, as customer feedback is a vital component of product and brand development. These people feel invested in the brand, as if they were employees. They’re Loyal – Unlike purchasers, loyalists stick to one brand in a particular category. This group is the most likely to exhibit combinations of the other three characteristics. Some customers will only exhibit one characteristic while others may cross all four. For example, a frequent purchaser may not refer friends, but they’re still engaged. Or vice versa – some brands have people who aren’t paying customers but are frequently sharing content. Each of these four characteristics has a tangible value to the brand. The end goal is capturing loyalty, but engaged customers (some of whom may never become loyal) will still make a huge impact. Every yang has a yin, and so it is with engaged customers. Disengaged customers are people who just don’t have a response to a brand. It isn’t necessarily a bad trait – people only have the capacity to fall in love with a few brands. For example, I’m pleased with the brand of sweetener I mix in my coffee each morning, but I haven’t signed up for their email list. If the grocery store doesn’t have that brand available, I'll choose a different sweetener. But if it's there, I'll grab it. Other people LOVE the sweetener brand, I’m sure. They subscribe to the mailing list and "like" them on Facebook. But in my view, it’s a good product that meets my sweetener needs, and that’s all. Then there are actively disengaged customers. These are folks who are intentionally trying to detract from the brand. They’ve had a bad experience and feel wronged, so they’re going to trash the brand to friends, post negative reviews online, and troll official profiles on social media. The good news about both of these groups is they’re still in play to become engaged. Disengaged customers aren’t usually dissatisfied customers. They just don't have a reason to give a damn yet. Actively disengaged customers can be won back, and are worth investing in. They're currently beating the brand up with a loudspeaker online, but that loudspeaker could be used to evangelize for the brand. Go make it right with them. Customer engagement is a worthy goal for any brand, and the surest path to loyalty. The best way to build it is with customer-centricity. That means every aspect of the brand is geared toward what customers want from it. It means every experience, every detail, every email is positive. Every interaction should affirm the customer's decision to make a brand part of their life. Customer engagement is sort of Access Development's sweet spot. If you're interested in strengthening your own customer engagement, subscribe to this blog, or click here to download our free Earning Engagement eBook.